My Doulton Lidded Jug – Can You Help Date it? Can anyone help identify or date this Doulton Lidded Jug? This Doulton Lidded Jug or Coffee Pot is about 18 ins tall with white lilies painted on one side and pink lilies on the other. There is a mark on the bottom that I can’t make out. The lid has a kite shaped mark above which is DOULTON the kite shape is cut out at the top with a half circle with IV inside under that is 29. 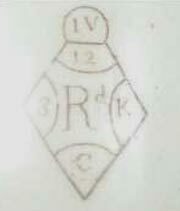 The right point has Y in it the bottom E the left hand point 12 and in the centre an R with the letter ‘a’ above and beside it. I can’t find this mark on any of the sites I have looked at. Can anyone help or advise me where I might look. Hi Linda, you need to check out our Victorian Registration marks page and compare your mark to the position indicators there. It looks as if your piece was designed by Royal Doulton in May 1879. The date refers to the registration of the design, and not to the date the piece was manufactured. There should be other marks that will help you discover when it was made and which Doulton designer made it.